Holidays are great times for reconnecting with old acquaintances. This past weekend, I spent some time with my best friend growing up. In the early 1980s, we would sit up until all hours of the night researching silent movie stars, wondering who was and who wasn’t still alive. 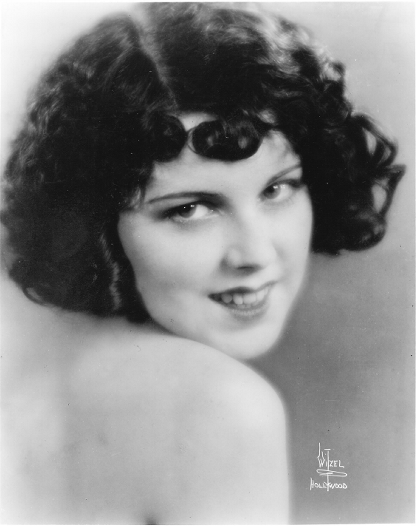 Benjie and I developed a particular interest in Olive Borden, a talented and gorgeous young actress of the silent screen. I devoted a chapter to her in my latest book, Dangerous Curves atop Hollywood Heels and she is the subject of a well-researched biography by Michelle Vogel. 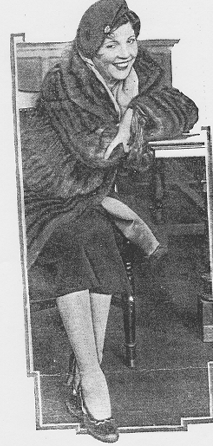 While catching up with Benjie this weekend, he and I went on the Internet to trace down a reference about Sybil Tinkle, a woman from Texas whose identity became linked with Olive in the late 1920s. For years, reference books have reported that Olive Borden was a Texan whose real name was Sybil Tinkle. 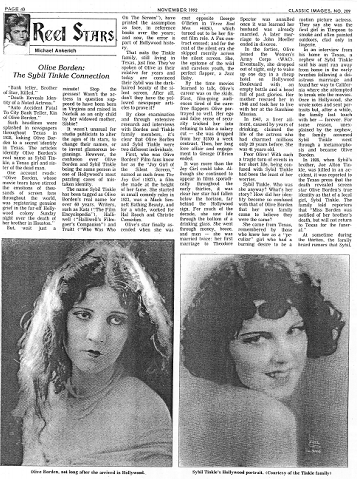 I devoted my column in Classic Images in November 1993 to unraveling the confusion and proving that Olive Borden and Sybil Tinkle were two individuals whose pasts were not linked. I thought it was settled. I had printed the truth and Michelle Vogel set the record straight in her excellent biography. Great book! Get it for your library. While researching for Tinkle on the Internet last Thursday afternoon, just after a hefty Thanksgiving feast, the name Sybil Tinkle popped up as Olive Borden’s real name. Not once, but countless times! My Thanksgiving vittles almost re-emerged in disgust. Will those turkeys ever get it right? It has been on my mind since, that strange story of how Olive Borden and Sybil Tinkle became entwined. Someone didn’t pull the name out of nowhere. It was a calculated move in the late 1920s to purposely connect the two women. When I returned to my home, I retrieved the old column I wrote for Classic Images. I am reprinting it here with additional commentery. Be patient; it sets the record straight. It unravels the Olive Borden and Sybil Tinkle connection. Such headlines were splashed in newspapers throughout Texas in 1928, linking Olive Borden to a secret identity in Texas. 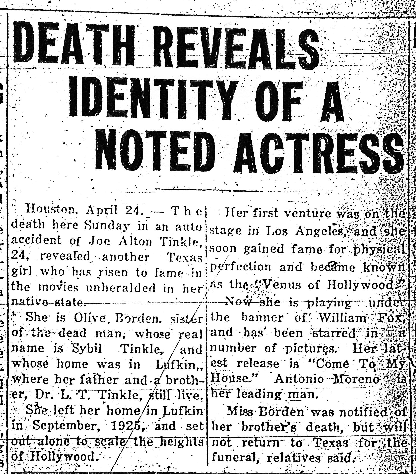 The articles identify Olive Borden’s real name as Sybil Tinkle, a Texas girl and the sister of the dead man. But, wait a minute. Wasn’t the actress in question supposed to have been born in Virginia and raised in Norfolk as an only child by her widowed mother, Sibbie? It wasn’t unusual for studio publicists to alter the ages of its stars, to change their names, or to invent glamorous beginnings. However, the confusion over Olive Borden and Sybil Tinkle being the same person is one of Hollywood’s most puzzling cases of mistaken identity. The name Sybil Tinkle has been tagged as Olive Borden’s real name for over 60 years. Writers, such as Katz (The Film Encyclopedia), Halliwell (Halliwell’s Filmgoer’s Companion) and Truitt (Who Was Who on the Screen), have printed the assumption as fact in reference books over the years; and now, the error is part of Hollywood history. That suits the Tinkle family, still living in Texas, just fine. They’ve spoken of Olive as their relative for years and today are convinced their Sybil was the dark-haired beauty of the silent screen. After all, don’t they have the yellowed newspaper articles to prove it? By close examination and extensive research, and interviews with Borden and Tinkle family members, however, it is clear that Olive Borden and Sybil Tinkle were NOT the same person. First, who was Olive Borden? 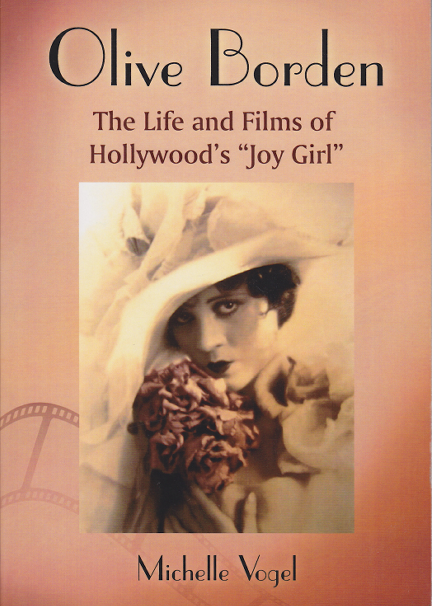 Film fans know her as The Joy Girl of the Silent Screen, named as such from The Joy Girl (1927), a film she made at the height of her fame. She started in small comedy roles in 1923, was a Mack Sennett Bathing Beauty, and for a while, worked for Hal Roach and Christie Comedies. Olive’s star finally ascended when she was cast opposite George O’Brien in Three Bad Men (1926), which turned out to be her finest film role. 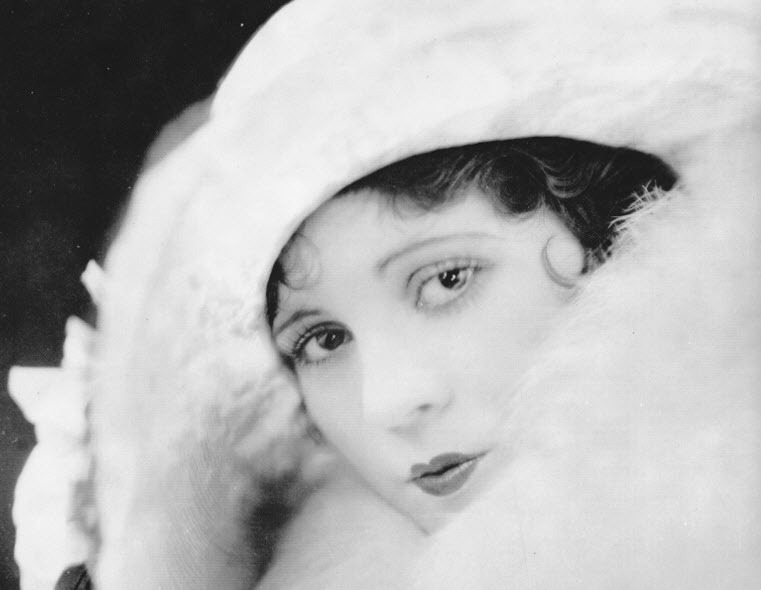 A Fox contract ensued and, for the rest of the silent era, she skipped merrily across the silent screen. She, the epitome of the wild and careless youth, the perfect flapper, a Jazz Baby. By the time movies learned to talk, Olive’s career was on the skids. First, film-going audiences tired of the carefree flappers Olive portrayed so well. Her ego and false sense of security tricked her into refusing to take a salary cut–she was dropped from her $1,500 a week contract. Then, her love affair with and engagement to George O’Brien ended. It was more than the Joy Girl could take. Although she continued to appear in films sporadically throughout the early 1930s, it was clear her star had fallen. For much of the decade, she saw life through the bottom of a bottle. She went through money, booze and men–she married twice; her first marriage to Theodore Spector was annulled once it was learned her husband was already married. A later marriage to John Moeller ended in divorce. In the 1940s, Olive joined the Women’s Army Corps (WAC). Eventually, she dropped out of sight, only to wake up one day in a cheap hotel on Hollywood Boulevard with an empty bottle and a head full of past glories. Her mother rescued her in 1946 and took her to live with her at the Sunshine Mission. In 1947, a liver ailment, caused by years of drinking, claimed the life of the actress who had charmed millions only 20 years before. She was only 41 years old. 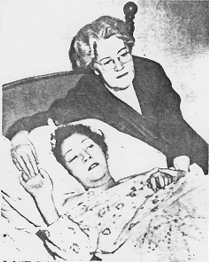 Olive on her deathbed. Olive’s mother, Sibbie, holds her hand. Poor Olive! With such a tragic turn of events in her short life, being confused with Sybil Tinkle had been the least of her worries. 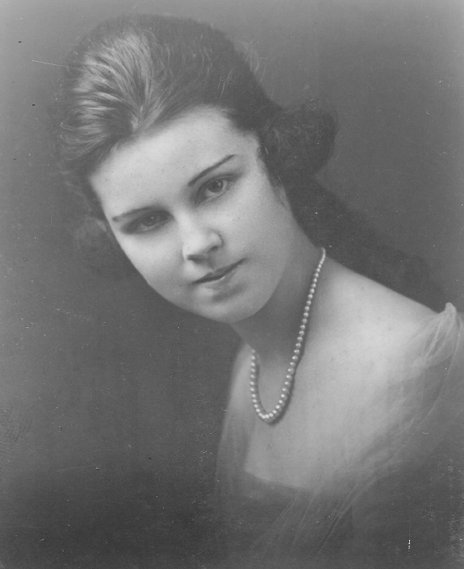 Sybil Tinkle. Who was she? What is her story? How did her identity become so confused with that of Olive Borden that her own family came to believe they were the same person? She came from Texas, remembered by those who knew her as a “peculiar” girl who had a burning desire to be a motion picture actress. They say Sybil was the first girl in Timpson to smoke and often painted outdoors, clad only in lingerie. In an interview from his home in Texas, a nephew of Sybil Tinkle said his aunt ran away from home in the early 1920s following a disastrous marriage and found her way to California, where she attempted to break into the movies. Once in Hollywood, she wrote notes and sent portraits but, after a while, the family lost touch with her–forever! For some reason, unexplained by the nephew, the family believed Sybil Tinkle became Olive Borden. 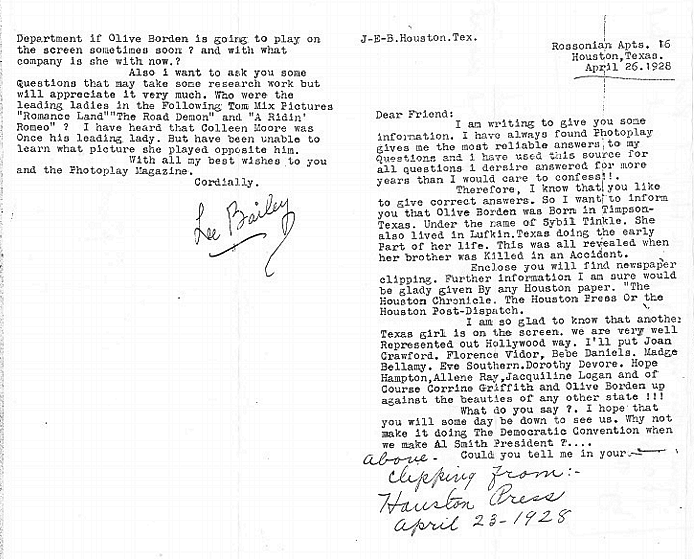 Not long after the local publicity, a Houston man, Lee Bailey, wrote a letter to Photoplay informing them of the connection between Olive and Sybil. I could find no mention of the letter in subsequent issues of the magazine. 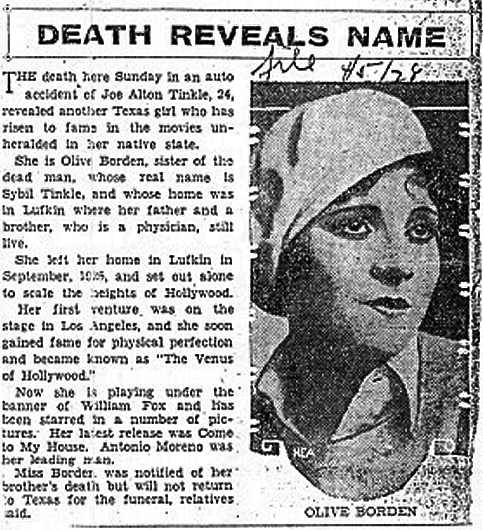 At sometime during the 1930s, the family heard rumors that Sybil, or Olive, had died in Los Angeles of tuberculosis and was cremated. The nephew said he remembered going with his father (Sybil’s brother) to Los Angeles to look for some records or evidence, but nothing was ever found. 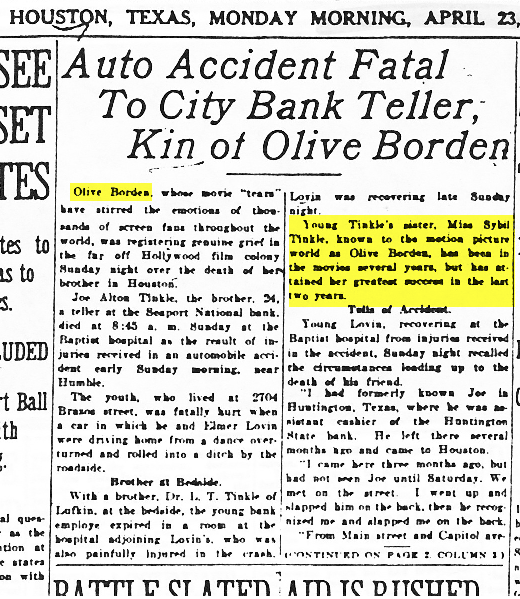 It was years later, after doing some research of their own, that the Tinkle family learned of Olive Borden’s death at the Sunshine Mission in 1947. So, that’s what happened to Sybil, the Tinkle family concluded. Such a sad ending for a girl who had so much ambition. It all sounds rather convincing until you look at the facts. It’s like a puzzle with all the pieces laying so neatly on a table. There’s only one problem, pieces just do not fit. 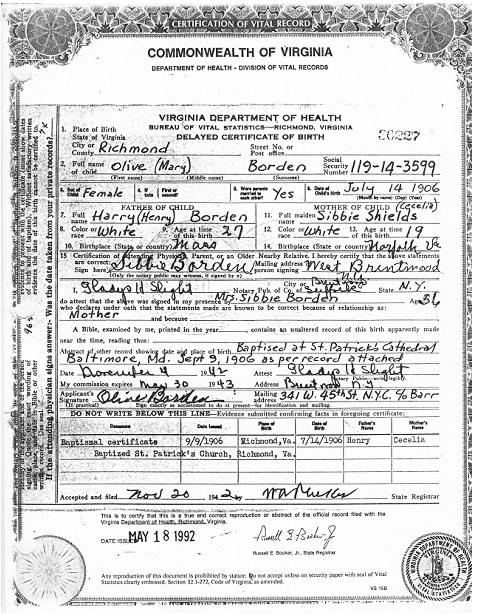 On file with the Virginia Department of Health is a delayed birth certificate from Olive Mary Borden, born July 14, 1906, in Richmond, to Harry (Henry) and Sibbie Shields Borden. The document shows Olive used her baptismal certificate, dated September 9, 1906, to obtain a birth certificate in 1942. It is known that Harry Borden died in 1907. Also, in 1942, in her own hand, Olive completed an Application for Social Security Account Number listing her place of birth as Richmond, Va., and her parents as Harry and Sibbie Borden. The 1908 Norfolk city directories show Olive’s mother living in Norfolk. The 1910 Norfolk, Virginia, portion of the U.S. Census shows Olive Borden living with her mother (Sibbie) in Virginia at the home of Olive’s great aunt. That same census lists Sybil Tinkle (born 1902) living in Timpson, Texas, with her father (James), her mother (Carrie), and her six brothers, one of whom was Joe Alton Tinkle. 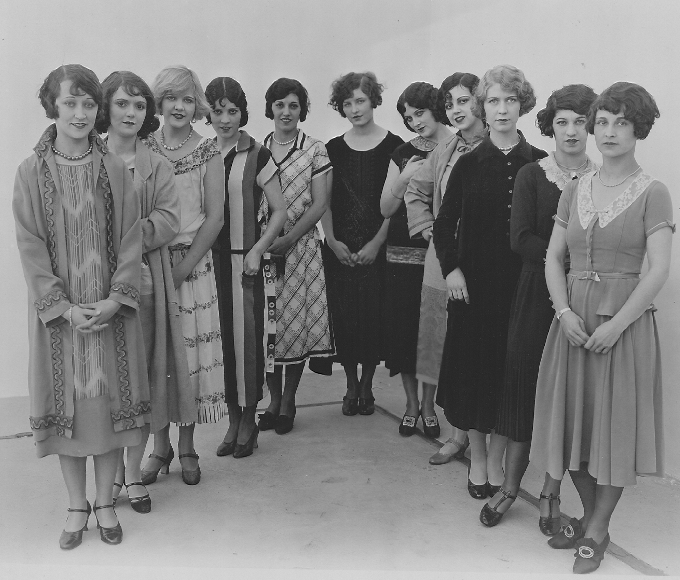 Also, in the 1920 U.S. Census, Olive is listed living with her mother in Virginia and Sybil with her family in Texas. In addition, Olive’s mother is listed in the Norfolk city directories from 1917-1922. For several of those years, her mother is recorded as having been a hotel housekeeper. No mention of Sibbie Borden in the subsequent city directories supports Olive’s early studio publicity that they left Norfolk in the early 1920s, and went to Maryland, before going to Hollywood in 1923 to try films. In an interview from her home in southern California, former silent film actress Natalie Joyce confirmed she is the first cousin of Olive Borden (their mothers were sisters) and that the family (including her own) was from Virginia. Natalie said that when Olive and her mother came to California, they stayed in their home until they could settle into a place of their own. The two were Wampas Baby Stars in 1925, but Olive’s career far surpassed that of her cousin’s. “She was really something there for a while,” Natalie said of Olive. Natalie retired from films at the advent of sound, moved to Hawaii, and became a beautician. Olive Borden’s death certificate mentions nothing about Tinkle nor a Texas connection. It supports the facts that she was a Borden from Virginia. The portraits the Tinkle family supplied of Sybil are definitely not the actress Olive Borden. So, Olive Borden and Sybil Tinkle were two different people from two totally different walks of life–will writers ever correct their errors? The resolution of one misunderstanding, however, leads to other questions. How did the Tinkle family link their loved one to Olive Borden? Why was the mix-up reported in the press so widely in 1928 after the death of a Tinkle? Did Sybil write to the family that she was Olive Borden? Or, could she have been Olive’s stand-in or double for a time? Did Sybil, as the Tinkle family has suggested, take over and carry on Olive’s name in the 1930s, after Olive Borden, because of excessive drinking, could no longer function on the screen–how preposterous! 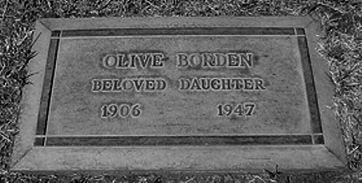 We know what happened to Olive Borden–she rests beside her mother at Forest Lawn in Glendale. But, whatever became of Sybil Tinkle? Hollywood can concoct some bizarre tales, but this mystery only proves one thing: truth IS stranger than fiction.